Hey there. I love music and I'm always looking for ways to enhance my music loving ways. Whether that be getting a sound bar for my TV, getting a great Bluetooth speaker, or getting an awesome set of headphones so that I can listen to music wherever I am. The thing is, though, that I commute a few hours to work each day and I can't take speakers with me so headphones are what I'm using the most at the moment. This is why I was extremely thankful to our friends at Mpow for sending me their Mpow Swift Bluetooth Headphones to try out and review. I've had my fair share of headphones and I've had some great ones and I've had some bad ones. I can honestly say that Mpow's headsets have not disappointed and I hope that the Swift Blutooth Headphones will follow suit. So before I get into my experience, let's talk specs. First off, the design. The design is a little weird for me, but only because I am so used to having full ear coverage headphones or those small earbuds that go inside the ear. This earpiece is a little bigger than what I am accustomed to be but that's actually a good thing. It was easier to push the buttons on the head piece and there was little fumbling around. Also, being a bit on the bigger side reduced the amount of noise and wind that entered the ear. I thought this was pretty great. I have had several other headphones that offered noise reduction technology but these Mpow Swift Bluetooth Headphones may just top them all. This is especially useful when going out for a jog or hiking. The last thing you want is that, "swoosh swoooooooosh" sound disrupting your sweet, sweet tunes. A surprising plus there. Anyways, the earpieces also fit pretty snugly into the inner and outer ear. The headphones also come with several earpieces that you can exchange to customize the fit for maximum comfort. The earpieces are connected with a single wire that's about 20 inches or so. It's long enough to accommodate just about anyone. The power button and the volume buttons are easy enough to find and use so I don't think I need to spend much time talking about that. The only problem that I found with the design is the small tab that covers the micro USB port connection to charge your headphones. That little tab is really stuck in there and I found myself spending a minute or so trying to remove it to charge my headphones. It could just be that I haven't opened and closed it enough to wear out the tab a bit and make it easier to open but it definitely was a struggle. It's nothing major and I'm sure it won't be an issue the longer I use them but it's definitely something to make note of. Charging time and listening time are pretty decent. Even though it says that Mpow Swifts will last about 5 hours, I've been able to use them for up to 6 continuous hours. Also, charging times vary but I have been able to charge the headphones from dead to 100% in about an hour or so. Not too bad, if you ask me. Now, for my experience... I tested out the Mpow Swift Bluetooth Headphones during my morning jogs and during my daily commute to work. During my morning jogs, I was pleasantly surprised that the earpieces stayed in my ear. I was a bit concerned that because they were bigger, they would have a tendency to fall out while running. That was definitely not the case. Also, as mentioned above, the wind reduction was phenomenal. There was little to no air noise while jogging! This was great since I didn't have to turn up the music so loud to drown out at wind noise. This made it safer for me to be out on the sidewalk or street since I didn't have music blasting in my ear. Also, the Bluetooth connection never faltered. 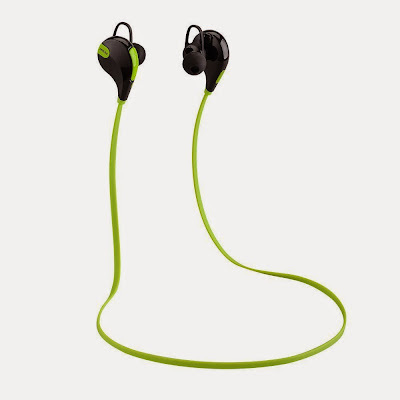 I usually have my phone attached to my arm while running and even though it was constantly moving, the Mpow Swift Headphones stayed connected. I also loved that I was able to easily wipe off any sweat from the earpieces and wire. I was afraid that maybe a bit of sweat would damage the headphones. I simply love a good set of headphones that can withstand a workout. So there you have it. The Mpow Swift Bluetooth Headphones are stylish, with a full, rich sound, that will keep you connected to your device no matter where you go. With max comfort in mind, leaving them in for hours at a time will not be a bother so you can listen to music during those long commute/workout sessions or watch that 2 hour movie without a hitch. You can pick up a pair of these bad boys for under $30 at Amazon. Make sure you pick them up before they go out of stock! Later!